I am SOOO excited to share this recipe with you! Whenever we have family get togethers everyone looks forward to my daughter Kelly making her “nearly” famous Corn Chowder! She found this recipe on the food network and has been making it for a few years now. We all love it. ♥ She usually makes a double batch and we get to enjoy it for a couple days. I don’t even get in her way when she is putting it all together because she has it down to a fine art! So I just let her go at it, and then enjoy the fruits of her labor. 🙂 We all do. It’s quite delicious and I hope you enjoy it as well. The only thing she said she does different is the recipe says to use the bacon as a garnish when finished, but she leaves it in from the beginning. It does look pretty to set aside a few bits of bacon for the garnish though. (Totally foo foo stuff!) And you may want it thicker than what this turns out. 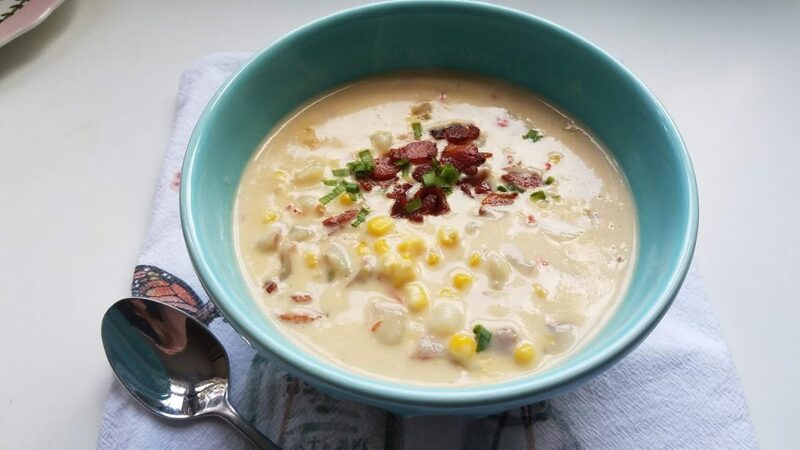 That can be accomplished by using a little more flour at the beginning or make a flour water mixture to work into the chowder in the last 15 minutes of cooking.